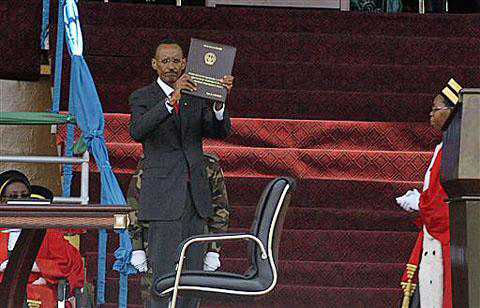 Rwandan President Paul Kagame was sworn in to serve another seven-year term on Sept. 6, 2010, 11 days after the explosive Aug. 26 leak of a U.N. report documenting genocide committed by his army in the Democratic Republic of Congo. Kagame, a general who took special training at Fort Leavenworth, Kansas, in the United States, has long been credited with ending the horrific violence known as the Rwanda Genocide, against both Rwandan Tutsis and Hutus in 1994, but his actual role then, and in the years before and after, is so fiercely disputed that French and Spanish courts and a civil lawsuit filed in Oklahoma City all accuse him and his top officers of ordering the political assassinations triggering the Rwanda Genocide and with war crimes, crimes against humanity and genocide. During the third week of July in Spain, protestors objected to Kagame’s visit to attend a U.N. conference by taking to the streets with their hands, faces and clothes drenched in red paint to simulate blood, chanting “Kagame Killer!” and holding up signs reading “Paul Kagame = Genocidio en Africa.” In response to complaints from human rights campaigners, Spanish Prime Minister Jose Luis Rodriguez Zapatero finally withdrew from a U.N.-backed meeting with Kagame. No Western heads of state attended Kagame’s inauguration, though former British Prime Minister Tony Blair, who sits on Kagame’s Presidential Advisory Council, sent his congratulations. President Barack Obama’s National Security Council and Canadian Foreign Minister Lawrence Cannon both expressed grave concerns about political repression after Rwanda’s Aug. 9 presidential polls, in which Kagame won 93 percent of the vote, a dubious victory in any real multi-party democracy. American evangelical pastor Rev. Rick Warren, another member of Kagame’s Presidential Advisory Council and one of his closest allies, not only attended but also delivered the invocation at the Kagame inauguration, as he had at Barack Obama’s inauguration on Jan. 20, 2009. Warren made Rwanda his first “purpose-driven nation” in 2005, after a 40-days and 40-nights campaign recalling the 40 days and 40 nights of rain in the Old Testament, when, according to the Book of Genesis, God wanted to cleanse the earth. Rwandans were urged to read Rick Warren’s book, “The Purpose Driven Life,” in school, at work, at home, and in church. Warren has not made a statement about the leaked OHCHR report documenting genocide by Kagame’s army in D.R. Congo or the upcoming official release of the report on Oct. 1. Barack Obama, whom Rev. 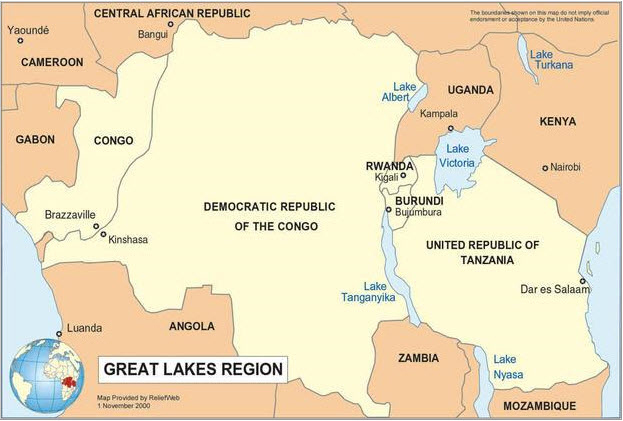 Rick Warren endorsed during his 2008 presidential campaign, has not yet responded to the leaked report either, but many Rwandese and Congolese, including exiles, refugees and genocide survivors in Canada, Europe and the U.S., are closely watching signs as to how he will. A U.S. coalition of NGOs including Friends of the Congo, Africa Faith and Justice Network, the Chicago Coalition for Congo, Foundation for Freedom and Democracy in Rwanda, and Mobilization for Peace and Justice in Congo argue that the report should signal the end of the special relationship between the U.S. and the Kagame regime, in which Kagame has often been misrepresented and even extolled as a great leader. San Francisco writer Ann Garrison writes for the San Francisco Bay View, Digital Journal, Examiner.com, OpEdNews, Global Research, Colored Opinions and her blog, Plutocracy Now. She can be reached at anniegarrison@gmail.com. This story originally appeared in Digital Journal. 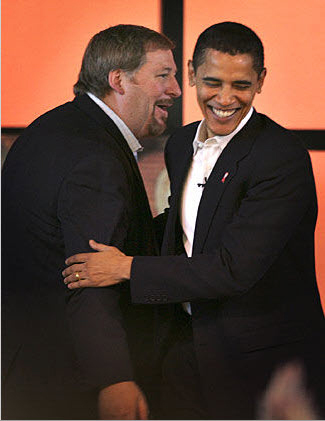 Rick Warren hosted Barack Obama and John McCain at his church in a widely televised forum. He never endorsed him or McCain for President. He is a pastor of people from both political parties. If he didn't formally "endorse" Obama, he did so informally, and adamantly. Hence, Rick Warren was invited to pray at Obama's inauguration. And I'm sure that encouraged Obama and the Democrats' decision to refund PEPAR, the President's Emergency Plan for AIDS Relief, for $50 billion, three times the amount that Bush and the Republicans originally funded it for, after much arm twisting from Rick Warren. I believe that means that some $16 billion plus of U.S. taxpayer's dollars is going to fund Rick Warren's abstinence only until heterosexual married monogamy for life agenda, mostly in thirteen African countries, including Rwanda, Uganda, and Zambia, and, Haiti and Vietnam. And give me a break. You cannot be a pastor to the people of both parties and hunger after power at Davos, on the Council of Foreign Relations, and in Rwanda, and everywhere else, as Rev. Rick Warren does. He is the most power hungry preacher I have ever seen. REv. Warren needs to re-read Genesus. Noah would be surprised about only spending 40 days and nights in the Ark.. My Bible states it was over a year. Is Warren all talk and no scholorship? Yes, that's true! It rained for 40 days and 40 nights…….but Mr./"pastor"Warren is getting a lot of things wrong these days……people need to get back to the Bible…….read it for themselves and stop listening to mans interpretation. "Let every man be a liar, but God be true". That's in the Bible, if anyone wants to look it up. I am not religious, but I am a "born again" Christian and Rick Warren is Not one of us. If you were to read the Bible you would see he is one of the "end time churches' who lead thier people astray and join the Anti-Christ . We have many,many Black, White, Hispanic,& Asian brothers and sisters who are all working hard to bring as many as we can into the Kingdom of God before Jesus comes, and it looks like it will be sooner than we realize.My question is: is America the Babylon that will get destroyed in one hour? Amen to that Rayma!!! We few that actually believe what the Bible says and have "not departed from the faith" have to stick together and speak up every chance we get!!!! Your question about America being Babylon, it is very possible. Thank you Jesus, that we will soon be going home. Wake up America before it's too late………and it does matter what God you pray to and all paths do not lead to Him. Jesus is the Way, the Truth, and the Light and no one can come to the Father except by Him. Read the Gospel of John and find out who He is. You will never be sorry. Your choices here on earth will affect your eternal destination. Time is running out and no one can deny that fact. I was wondering what kind of prayer Rev. Rick Warren was saying at Paul Kagame`s swearing in ceremony. It was really very shameful to see a so called minister taking politics as a prayer. The only person who made a real prayer was a catholic bishop named Smaragde who did not take Kagame as a god to praise.He was praying to the true God.Others (Rick Warren and a muslim leader named Habimana Salleh)were just saying politics and making Kagame as a "god" and they forgot that his hands are bloody !! !Millions of people killed under his orders !!! Ann Garrison, the author here. That's probably my mistake. I'll go back and fix it but leave this here so as to own my own error. I knew that the 40 days and 40 nights was Warren's reference to Noah and the arc, but not being a Biblical scholar myself, I forgot the that the rain, not Noah's time on the arc, was 40 days and 40 nights. Amen to your comments, you said it as I would. walk; I do not personally regard him as a brother. @Jeremie: You asked for it, here it is. @Ann: you could not be more wrong. There are alot of good viewpoints being expressed in this thread about this topic. truthbtold and Jeremie are especially on point with thier analysis. Look, I won't sit here and cite scripture and talk that biblical talk because as I stated earlier, I am not religous. My main contention is that these White christians seem to have no trouble stirring up problems halfway around the world, and they seem to have immunity. Case in point, Pat Roberson has blood on his hands by backing Pres. Taylor in Liberia. Why isn't Roberson brought before the Hague? Or the white evangelicals who got Uganda to put the gay execution law on the books. Brothers and sisters in Christ – please let us look beyond the human or humans doing wrong – see who is "pulling the strings" so to speak – and while we still have life and health and breath – pray for those who seem to be going astray. Pray for blind "spiritual" eyes to be opened = pray for God's mercy on this earth at this time. I believe time is short – our "clock" is nearly at midnight and the Lord's return very imminent. Eternity is a long time – forever – ad olam – and I would not wish my worse enemy to go to the place that the bible describes as "hell". Christ told us to pray for "those who descpicably use us". His compassion and love is not easily understood – but as Iwe have been blessed to be forgiven – they need a chance too. Yes we better wake up, because the entity that is operating behind the scenes is really doing a heck of a job. We must!! focus on our "SPIRITUAL EYE" not our "CARNAL EYE" we must PRAY, PRAY, PRAY.